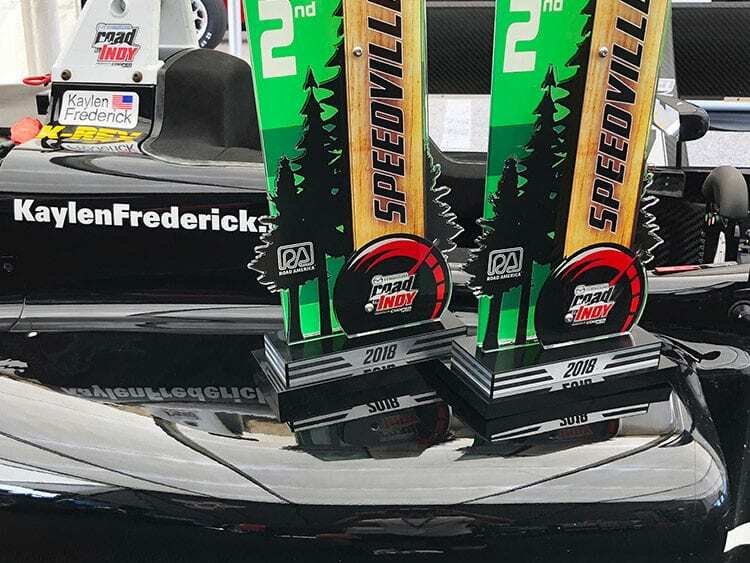 Road America: Double 2nd Place!! The recently turned 16-year-old Kaylen Frederick, from Potomac, Md., finished second for the second straight race for locally based Pabst Racing (following his recent 2nd place at Lucas Oil Oval), while Irishman Keith Donegan finished third for BN Racing in a race that ended under full-course yellow. Swedish rookie Rasmus Lindh (Pabst Racing) led the field to the green this afternoon, only for Kirkwood, who started second, to draft past into the lead before Turn One. Frederick, who started fourth, braked deep in Turn One and dropped behind Lindh into third place, sneaking ahead of yet another Pabst Racing Tatuus USF-17 driven by third-place qualifier Calvin Ming, from Georgetown, Guyana. A pair of Brazilians, Igor Fraga (Exclusive Autosport) and Lucas Kohl (Pabst Racing), also were in the thick of the action until Turn 13, where incidental contact ended with Kohl spinning to the back of the pack. Fraga continued in fifth, right behind Donegan, who somehow negotiated his way from 10th on the grid to fourth by the completion of the opening lap. Kirkwood seemed to have the measure of Lindh as he pulled out to a lead of 1.4 seconds inside the first three laps, only for his advantage to be negated by a full-course caution after Sabre Cook slid into the gravel at Turn 10. There was more drama at the restart, when the slow pace caught out several drivers in the midfield. South African Julian Van der Watt (Team Pelfrey) was among the victims as he inadvertently contacted another car, causing severe nose-wing damage which resulted in a pit stop for repairs. Kirkwood maintained his lead over Lindh, Frederick and Donegan, with Kory Enders (DEForce Racing), from Sugarland, Texas, holding off a snarling pack of hungry youngsters in fifth. Frederick’s pressure on his teammate paid off on Lap Eight when he took advantage of the draft to move into second. Later during the same lap, at Canada Corner, Donegan also managed to fight his way past the young Swede, who ran wide on the exit and immediately lost out to Enders, too. Lindh battled his way back into fourth a couple of laps later, but any hopes of redressing the balance to Donegan were thwarted when Cook slid off the road in Turn Seven to ensure another full-course caution. With no time left for a restart, Kirkwood was duly declared the winner, with Frederick and Donegan rounding out the podium. 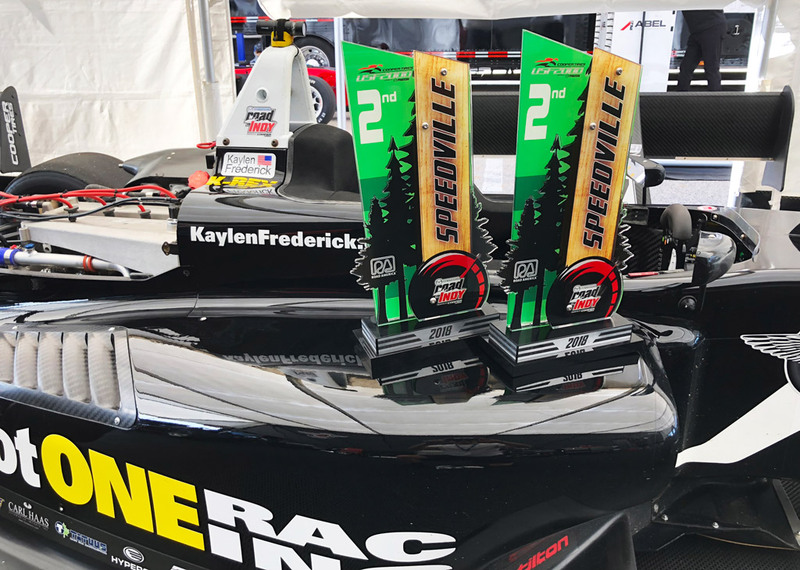 Potomac, Md., youngster Kaylen Frederick also found a way past Brazilian Kohl on the final lap to ensure another Road America 2nd Place finish for the Oconomowoc, Wisconsin-based Pabst Racing. 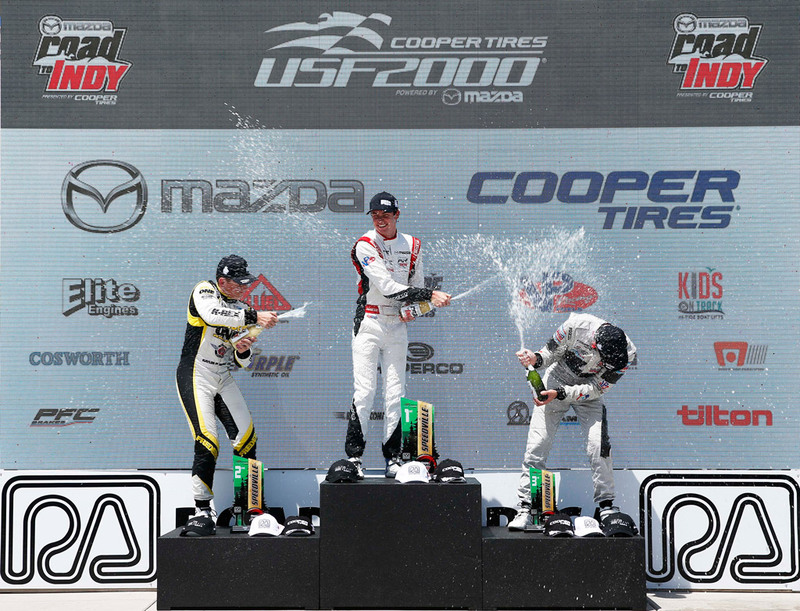 The action was non-stop in this seventh round of the Cooper Tires USF2000 Championship Powered by Mazda, including three full course cautions and finishing with 12 DNF’s. At the start, Kirkwood passed Frederick on the draft into Turn One. Frederick returned the favor at Turn Five and passed Kirkwood around the outside. Incidents began to stack up after the start when two cars tangled in Turn One and then two more were eliminated in an incident even before the braking area for Turn Five. Cue the first of the full-course cautions… but not before Kohl already had jumped from third on the grid to the lead ahead of Pabst teammates Rasmus Lindh, who had started on pole, followed closely by Frederick In Car 24. The green flags flew again after a couple of laps behind the Mazda Pace Car, and once again the action at the front was intense. Kohl successfully fended off his pursuers to maintain the lead, while in his wake Frederick took full advantage of the draft to vault briefly from fourth to second passing Kirkwood and Lindh. It didn’t last for long. Lindh banged wheels with Frederick at Turn Three resulting in Kirkwood moving back to third and Frederick slipping back to 4th. Shortly thereafter, Lindh contacted Kirkwood’s front wing causing a puncture, after which Lindh found himself on the outside line at Turn Five and with nowhere to go but the escape road. Frederick then moved back into third trailing Kirkwood closely. The latest carnage ensured yet another full-course caution, which left time for only a one-lap dash to the checkers. This time Kirkwood timed his restart to perfection, drafting past Kohl cleanly before Turn One to assume the lead for the first time and claim the win. Frederick tucked behind Kirkwood with a deep braking line in Turn Five and hustled past Kohl. In pursuit of Kirkwood but unable to reel him in, Frederick secured his second P2 finish of the race weekend. The pair of podium finishes provided Frederick a solid boost in the Championship rising from 9th to 3rd in the standings. Pabst Racing also gained ground and is now tied on points for the lead of the Team Championship.